It’s hard to overstate just how important the Mustang has been to Ford over the last fifty-odd years, and it’s no exaggeration to suggest that this fully paid up motoring icon has saved the blue oval’s collective bacon on more than one occasion over that same span of time. Certainly the last ten years have been very good ones for Ford and Mustang owners alike, with the retro-looking fifth generation having taken the car back to its grounded, honest roots, and the recently unveiled S550 seeming to have picked up right where the old one left of. The latest car is of particular interest to those of us that happen to live on this side of the pond, because, and you’ve no idea how excited it makes us to be able to type this, Ford has finally agreed to officially sell the Mustang in Europe. No more slightly suspect left hand drive imports with dubious histories, just an amazing car with a fantastic range of engines – and all legit and UK legal! 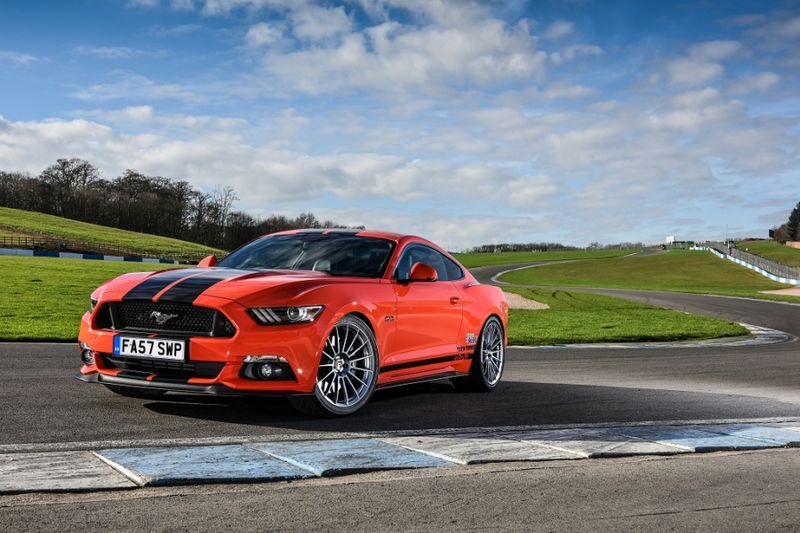 Tuners have been predictably quick to react to this news, and British ‘stang owners can already pick from an impressive array of aftermarket parts and packages, though few have had the guts to stump up for a Mustang of their own, then follow through by putting their own stamp on it. Milltek Sport is the exception here, with the exhaust gurus having wasted no time in getting to grips with the iconic ‘pony car,’ coming up with the example you see here. Milltek’s history of demo cars is nothing short of sensational and reflects their commitment to building the best exhausts for the world’s greatest performance cars, but this Mustang, owned by the MD of the company no less, well and truly takes the proverbial biscuit. Much has been made of the Mk6’s interesting range of Euro-friendly engines, with the 2.3 EcoBoost (the same unit that does such sterling service in the all new Focus RS) expected to make up for the bulk of sales on this side of the Atlantic, but Steve couldn’t resist going all out and opting for the 5.0 Coyote V8. This makes a lot of sense, as not only is the V8 the engine that’s most closely associated with the Mustang in all its forms, it’s the engine that’s likely to see the greatest performance benefits from Milltek’s extensive exhaust work. The lump in question is a long way removed from the old school V8’s that accompanied Mustangs of old: it features 32 valves, quad cams, and a relatively lightweight construction, traits that make far it better attuned to the tastes of European consumers than its somewhat archaic fore bearers. Don’t go thinking that age and (relative) sophistication have served to dilute this engine’s appeal or raw power though, as this simply isn’t the case. The unit in Steve’s car makes a meaty 420bhp in standard guise, a figure that’s since been revised and improved upon by Milltek Sport. Several months of intensive research and development followed, with all manner of exhaust setups designed, trialled and rejected before Steve and the team settled on the system that now adorns the Mustang; a stainless steel cat-back exhaust and X-Pipe quad outlet with GT-90 trims. This is a deceptively trick setup, one that manages to build upon the already aggressive qualities of the factory system without ever becoming annoying or intrusive. Those hours spent painstakingly designing and mandrel bending it to perfection also mean that it offers proven performance benefits, with gasses given a free flow to the rear of the car, right out out to atmosphere. Steve estimates that the system alone is worth an additional 15bhp of power. “We now offer a number of options and finishes so Mustang owners can pick the system that they think work best with their rear valance treatment. I picked the GT-90 trims as they complement my car’s Roush Performance quad-outlet rear valance and make the rear end look that bit more impressive. 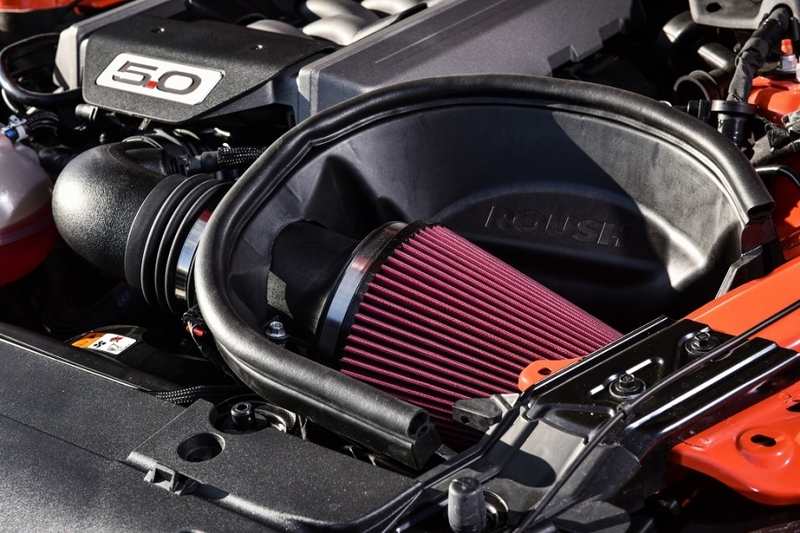 ”The Roush treatment is also in evidence further up the drivetrain, with the Coyote V8 now breathing deeply through one of the iconic tuner’s air intake systems, a bit of kit that contributes to the Mustang’s new peak power figure of 456bhp, all delivered in a suitably charismatic fashion. The Mustang’s weak spot (other than its lack of availability in the UK) has traditionally been its resolutely old school chassis, Ford having opted to retain an ancient ‘live axle’ arrangement long after European rivals made the jump to independent rear suspension. While this might’ve been true of previous generations of ‘pony car,’ it certainly doesn’t apply to the S550, a Mustang that really can go toe-to-toe with the best Europe has to offer, largely thanks to a trick IRS setup developed specifically for this model. Not that Steve’s left it as Ford intended though, where would be the fun in that? 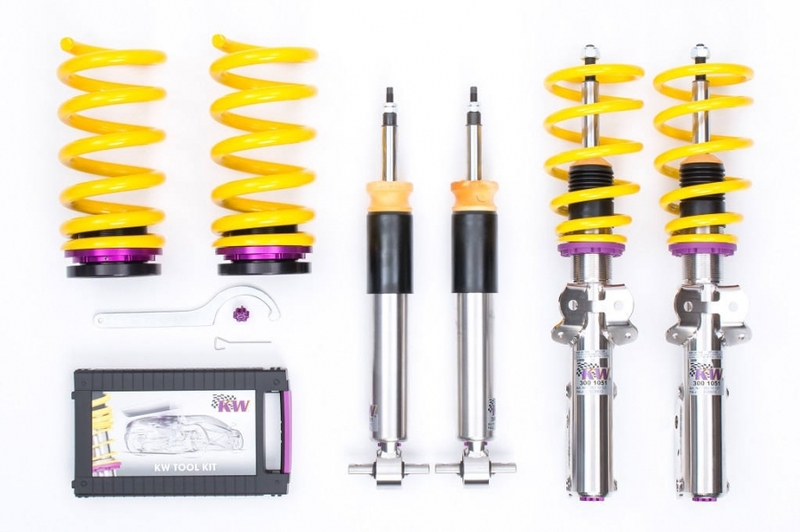 It’s now sprung on KW Variant 3 coilovers, with mighty 20×10″ and 20×11″ HRE FF15 alloys wrapped in sticky Toyo R888 rubber at all four corners. 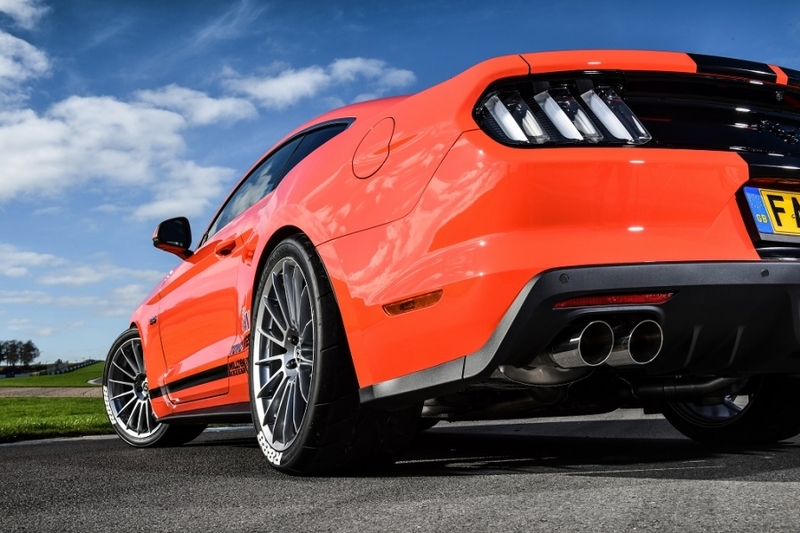 Not only have these changes cut down on unsprung weight, they allow it to put all of that extra power to the ground in a fashion that simply wouldn’t have been thought possible in a Mustang from a previous generation. Other changes have been restricted to the exterior, those custom Le Mans stripes being the most obvious deviation from stock spec. On a more conventional, demure looking car these would look out of place and over the top, but there’s no doubting that they suit the Mustang’s bluff, tough, chiseled lines to a tee, as do the Diode Dynamics LED Tri Bar daylight running lights.